Similarly, the value of these imports fell by the same percentage to 360 billion yen. This stability comes despite some volatility in the Japanese pork wholesale markets as they have responded to global trade developments and the outbreak of ASF in China. Following a 4 percent decline (-5,400 tonnes) in the first half of the year, shipments from the US have since recovered slightly. This has led to a 1.5 percent (-2,900 tonnes) year-on-year drop for the first three quarters of 2018 overall. Meanwhile, imports from Canada picked up by 3 percent (+4,200 tonnes) compared with year earlier levels. It seems Canadian product is increasingly being favoured over US product, perhaps due to higher quality standards from this more export focused nation. An increasing number of Japanese chains now stock Canadian pork, and in April Costco Japan switched from US to Canadian chilled pork throughout the chain. This contract should remain supportive to imports of pork from Canada in the long run. In 2018 to date, imports from EU countries were unchanged on the year and accounted for 36 percent of total pork supplied. To achieve this overall stability, growth was required from a number of suppliers to counteract lower shipments from Hungary; this country was blocked from supplying Japan after discovering ASF in its wild boar in April. 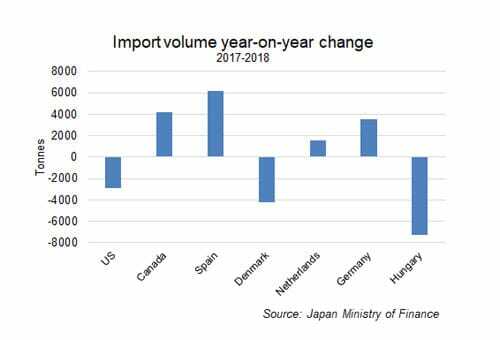 Imports from Germany were up significantly by 26 percent (+3,600 tonnes) on the year and imports from the Netherlands increased by 8 per cent (+1,500 tonnes). Conversely, imports from Denmark, typically the largest EU supplier, were down 5 percent (-4,200 tonnes). This meant Spain became the primary EU trader with a 35 percent share of imports from the EU. Stable growth in consumption has been supporting both the domestic Japanese pork market and import volumes. In contrast to Europe, Japanese consumers have reportedly been moving away from fish and towards pork and other meats. With this in mind, and given limitations on domestic production, pork imports are expected to grow further in the coming years. The latest USDA forecasts anticipate a one percent increase in imports over the coming year.